Fits Spirit Yoga Bags will fit all 3mm and 6mm Yoga Mats / Cargo Pockets are perfect for keys, cell phone and other essentials. 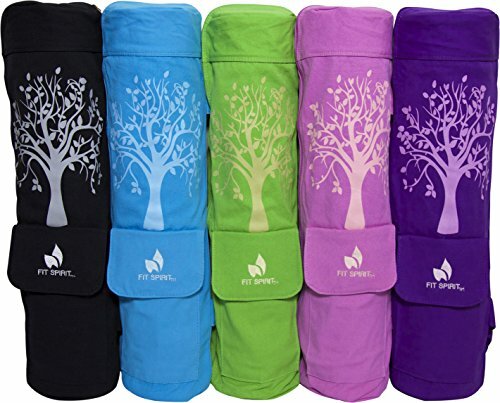 Maximize your Yoga Experience with our new Fit Spirit Yoga Mat Bags. Our bags were designed to hold all key components of your Yoga Class and everyday essentials. With its zipper cargo pocket, you can be sure to carry your day to day essentials hassle free and worry free. Fit Spirits Full Zipper design ensures you will be able to access your yoga mat with ease at a moments notice. With its durable 100% canvas material, why shop anywhere else for your Yoga Mat Bag, youÕve already found the best.